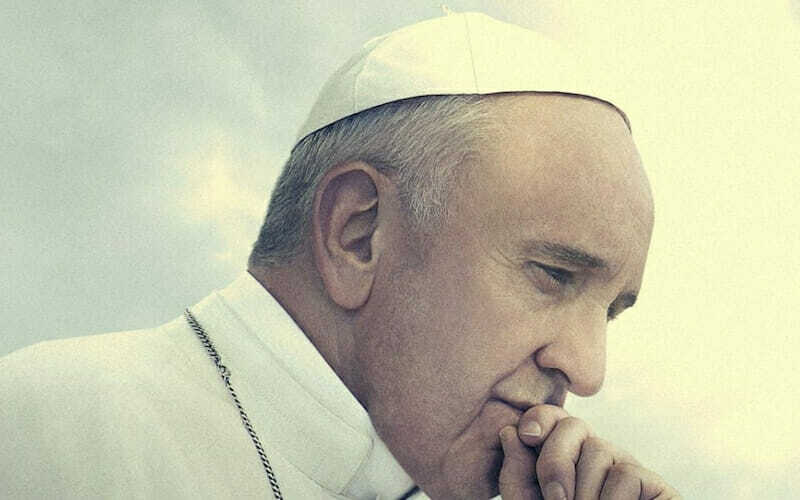 Pope Francis: A Man of his Word – Film Review by Frank L.
Wim Wenders career, he is now in his early seventies, includes such feature classics as Paris, Texas (1984) and Wings of Desire (1987) but he has also made documentaries which include Lightening over Water (1980), Tokyo-Ga (1985), Ode To Cologne – A Rock ‘n Roll film (2002), Buena Vista Social Club (1999), and The Salt of the Earth (2014). These films cover such diverse topics as film director Nicholas Ray, Japanese director Yasujjiro Ozu, the world of Cuban music, the Cologne rock group BAP and finally the photographer Sebastiao Salgado. To be added to this list now is a documentary about Pope Francis. Wenders was commissioned at the beginning of Pope Francis’ pontifacy by a film knowledgeable Vatican insider. He had access to the Vatican film archive and was also allowed four two hour meetings with Pope Francis. As part of the commission he was given artistic freedom to depict Pope Francis in the manner which he considered appropriate. Central to Wender’s portrayal is the choice in 2013, on his appointment as Pope by Jorge Mario Bergoglio, the then Cardinal Archbishop of Buenos Aires, of the name “Francis” as his title in honour of Saint Francis of Assissi who had lived in the thirteenth century. Pope Francis as the 266th Pope is the first one to choose that name. To underline the importance of this choice, Wenders has created a black and white movie within the documentary which depicts Saint Francis (Ignazio Oliva) as he led his daily life. This film within a film alternates the various statements of Pope Francis given in interview with the footage of Pope Francis from the Vatican archive. It therefore acts as a consistent reminder of the life which Pope Francis holds dear. Wenders has used relatively modest financial resources to create this entire documentary which of course accords with the comparatively unostentatious way in which Pope Francis has chosen to live his life throughout his reign as Pope. In the interviews the Pope expounds his views on climate change, poverty and the disparity of wealth. These are areas over which he has little power to effect change but to which the documentary gives great prominence. The documentary does not delve at any great depth with the role of women in the Roman Catholic Church or the Vatican’s views on homosexuality, even if what Pope Francis states in relation to these matters is more compassionate than what appears to be the official line of the Church which he leads. These, of course, are areas where he does have more power. Nor does it deal at all with some of his appointments as bishops during his pontificacy where he has presumably the greatest amount of power. Therefore, the documentary is necessarily selective but the cost of that selectivity is that only a partial image of Pope Francis emerges. As a film, as is to be expected from Wenders, he blends seamlessly the interviews with Pope Francis, the footage from the Vatican archive and the scenes from the film within a film. As a documentary it is an impressive piece of work. But it is worth remembering that it has a temporal importance in that its release is a mere two weeks prior to “the Apostolic Journey of His Holiness Pope Francis to Ireland on the occasion of the World Meeting of Families in Dublin”. It represents a fine example of the collaboration of an important creative artist with a still powerful institution. For that alone it is worth seeing and pondering.